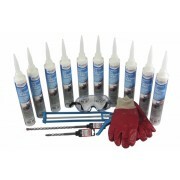 A great selection of DIY Damp Proofing Kits which can be easily installed. If you are unsure about how to install the damp proof creams, have a look at our detailed "How To Install Damp Proof Cream" guide. 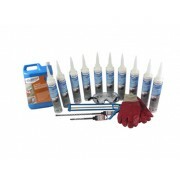 The DIY Damp Proofing Kits have everything you need to install a chemical damp proof course. If you require more Damp Proof Cream than specified please contact us for a bespoke damp proofing kit quote. 1. Locate a mortar joint at least 150mm above external ground level. For internal walls, insert the Damp Proof Cream in a mortar joint as close to the internal floor level as can be achieved. 2. Drill 12mm diameter holes horizontally in the mortar bed to a depth of 10mm less than the wall thickness at centres no greater than 100mm. 3. Remove all the dust from the holes using a blow out pump or with water. 4. If walls are dry or mildly damp, spray water into the holes until absorbed by mortar. This is a very important step as it increases the effectiveness of the Damp Proof Cream. 5. Fit Damp Proof Cream cartridge with nozzle supplied. 6. 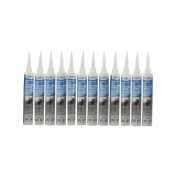 Inject the Damp Proof Cream cream slowly into each hole using a standard 400ml caulking gun. 7. Extend the nozzle of the gun to the rear of the hole and slowly withdraw the nozzle as the Damp Proof Cream fills the hole. 8. Once the Damp Proof Cream has been applied to the holes, the holes in external walls can be easily capped with SkilledBuild Injection Plugs - included in kits. 9. Internal holes should be plugged or plastered over using a suitable rennovation plaster, or by simply covering with a skirting board.